It’s Moscow during World War II, and young lovers Boris (Alexei Batalov) and his fiancée Veronika (Tatiana Samoilova) are parted when Boris enlists after Germany attacks Russia. When her parents are killed during an air-raid, her fiancé’s family give Veronika shelter in their home, where she is raped by Boris’ cousin Mark. Feeling guilt and having never heard from her fiancé since he left, Veronika marries Mark despite still loving Boris. Unhappy and feeling alone, Veronika becomes a nurse for the war effort, and later learns that Boris has been killed fighting in the front. Finding her inner strength, a grieving Veronika leaves Mark and, after witnessing the cranes flying above her, she sees this symbolism as a new beginning and hopes for a happy and romantic future. Though not as well-known as the popular Russian WWII love story ‘Ballad of a Soldier’ (’59), this is a marvelous sentimental tale mixing propaganda and poetry. Possessing a face that conveyed so much without words, lovely Tatyana Samoylova had her best role here and would go on to make a memorable Anna Karenina ten years later, in a colourful 1967 Russian adaptation. 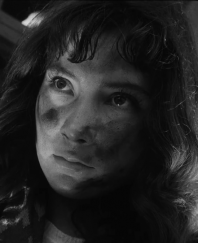 While the movie is superbly directed by Mikhail Kalatozov (who went on to make the acclaimed ‘I am Cuba’ in 1964), the most memorable aspect of the movie is the stunning black & white photography by cinematographer Sergei Urusevsky, whose early use of hand-held came from his days as a cameraman during the war. There are a number of memorable moments in the film, but the scene that stays with me is when Veronika frantically runs up the stairs of her burning building only to find that her apartment is no longer there. The close-ups on her pained face as she stares at an undamaged grandfather clock that still ticks, are unforgettable, and it’s this scene that has stayed with me since my first viewing over 20 years ago. A multi-award winner at the 1958 Cannes Festival, ‘The Cranes are Flying’ is a complete one-off and a must-see movie that remains one of my favourite movies of 1957.